Today is Friday! And I am happy to announce that my new website www.lauraashtonartist.com is up and running. It is a perfect compliment to this blog, my website offers further information on me and my art. 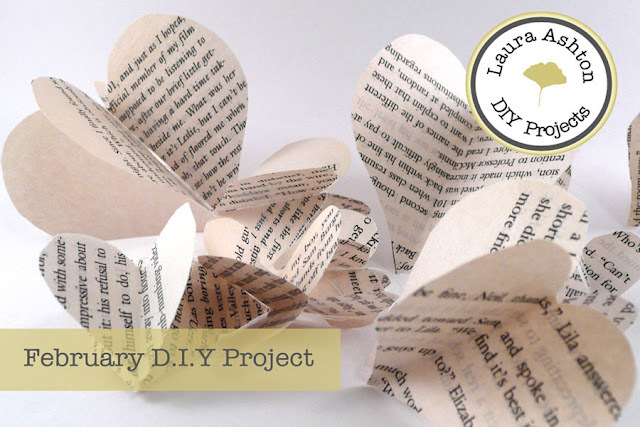 And I am super excited to launch the Free DIY Projects section. This page will be updated monthly with printable pdf instructions for DIY projects created by me. I have quite a few exciting plans in the works for this blog and website. Something I am going to be developing in the near future is video blog and art demonstration section on my website. In this section I will post some of my outdoor adventures with the scientist, as well as posting short video demonstrations for drawing and watercolour painting. So stayed tuned. Since it is February I thought it would be appropriate to post a Valentine's Day inspired craft for the DIY project. Lately I am really not into a huge jumble of pink and red plastered everywhere to celebrate the big day. So I have taken a somewhat understated approach by using up-cycled old books I got at the public library off discard rack. So please have a look and let me know what you think, hope you find some time to try it out! I found your lovely blog through a blog hop and I am following your blog now. Please visit my blog at http://www.EnzieShahmiri.com and follow me as well. P.s. Congrats on the new site! Thank you Enzie, glad you like it! Thank you so much for checking out my blog, yes I love colour but I tried to make sure the my blog is the neutral palette for the pictures and paintings that I post. Many time a busy blog takes away from a great post. Wow! You really are serious about offering free DIY projects on downloadable pdf files. Looking forward to doing some of the projects very soon. My wife is into hand crafts and she likes your take on Valentines using those old up-cycled books. Also, we appreciate reading your blogs. Keep it up! Thanks!